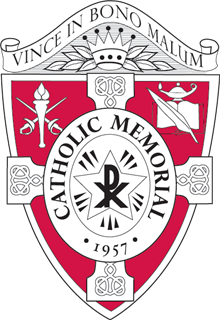 Catholic Memorial is a college preparatory school for boys founded in the spirit of Blessed Edmund Rice and guided by the Essential Elements of an Edmund Rice Christian Brothers Education. Our faith and learning community is dedicated to transforming boys' lives through academics, arts, athletics, and campus ministry. We challenge students to pursue excellence, embrace Gospel values and lead through service. Catholic Memorial School offers young men a unique educational experience based on Gospel values and dedication to excellence. We warmly invite you to learn more! Our forward-leaning, experientially oriented, project-based approach to teaching and learning inspires scholarship in every student, engages curious minds, and develops the character of young men. We enthusiastically encourage our young men to take advantage of all CM has to offer, from clubs and activities to programs and transportation. Our teachers are coaches at CM, supporting students through adversity and inspiring hard work and sportsmanship—educating on the field as well as in the classroom. Catholic Memorial is committed to transforming boys intellectually, spiritually, socially and physically. Succeeding in that mission is only possible through the generosity of countless alumni, parents, faculty, and friends who invest in us. We look forward to welcoming you back to campus for the Class of 1969 50th Reunion on Friday, May 3, 2019. Please see the tentative schedule of events below for all great activities you can participate in. We hope you can join us! The cost for reunion will be $100 per person. Please RSVP by April 19, 2019. Reminisce With Some of Your Favorite Faculty! Catholic Memorial is located at 235 Baker Street, West Roxbury, Massachusetts 02132. If you are attending reunion from out of town, here is a list of local hotels that are conveniently located near CM. Catholic Memorial, the Christian Brothers School of Boston, prepares boys for college, manhood and a world full of unknown challenges, ambiguity and complex problems and the importance of relationships.